Feline Mesenchymal Stem Cells (FMSC) have the potential to maintain multipotency and proliferate extensively in vitro. 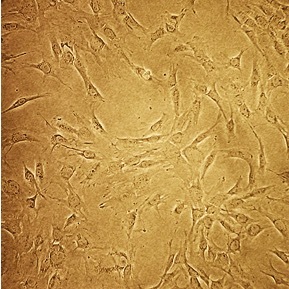 Bone marrow is the major blood creating organ, but in addition to supporting hematopoietic growth and differentiation, mesenchymal steml cells can be induced to produce cells of other connective tissues, such as bone, cartilage, and fat, as well as cells from neuroectodermal (neurons) and endodermal (hepatocytes) lineages. (Click to Enlarge) Feline Mesenchymal Stem Cells: FMSC. Isolated from the bone marrow, these cells support hematopoietic growth and differentiation, and can be induced to produce bone, cartilage, fat, neurons and hepatocytes.